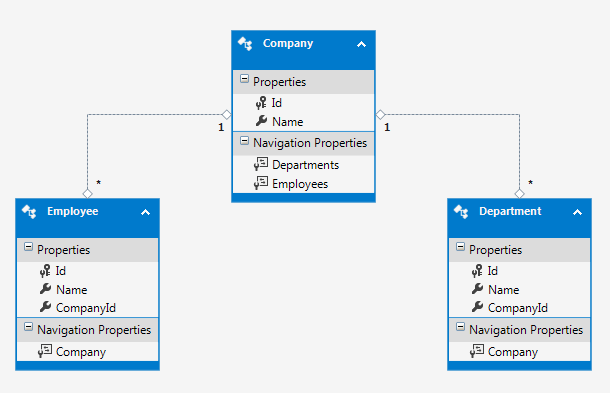 With the Entity Framework, we are able to use navigation properties to get the associated records. This however loads all the child rows for a parent which causes performance problems. In some instances, we may just need to get a count of the associated records without having to load all the rows. Let’s see more detail how this can be done. In the diagram below, we show the relationship between company, department and employee entities. We want to be able to get the company record with the aggregated count for departments and employees for each company. For this case, we can use the company navigation properties to get that counts and use a company view-model class to hold the additional information. With this lambda expression, we are using the navigation properties to get the count of the associated records. The query that is created and sent to the database is just one SQL statement that gets the company data and the associated rows count of the other tables. 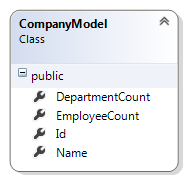 The result is returned as a list of CompanyModel objects. With this approach, we no longer need to load all the rows from the other tables using the navigation properties. This should improve the overall performance of the application.